The Perfect Storm NuCoal Field Guide contains complete army lists for the NuCoal Self Defense Force and the Port Arthur Korps. It also continues the story of the the War for Terra Nova and is the first in a series of Field Guides for the factions in the Heavy Gear Universe. This Full Color, 136-page book is a Field Guide (Faction Army List) for the Heavy Gear Blitz! miniature game. In addition to the core rulebook, some six sided dice, and Dream Pod 9 Heavy Gear miniatures are required for play. For two or more players, ages 8 and up. This eBook now also includes a free copy of the new Heavy Gear Blitz! Field Manual - Core Rulebook Revised (DP9-9997) eBook as part of the downloads. 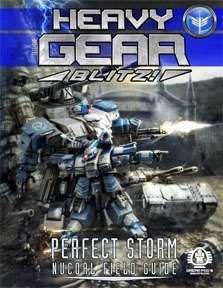 The Field Manual is a compilation of the popular Gear UP eZine fieldtest rules which have been integrated into the Heavy Gear Blitz ruleset for quick play and expanded ranges. Easy to reference flowcharts, updated datacards, and new options takes this offical update to the Heavy Gear Blitz rules to a whole new level.